We’ve rounded up our favorite dresses with jaw-dropping handmade details that are worth far beyond their price tag. From hand-placed crystals to meticulously sewn appliqués, check out why they’re worth it, below. Why it’s worth it: The hand-embroidered sequin floral appliqués give off a spring feel without being too loud—plus, the hidden corset keeps the dramatic ball gown in place (and your waist cinched). Why it’s worth it: The ultra-flattering, body-hugging shape, classic off-the-shoulder neckline, and hand-embroidered and beaded 3D floral appliqués throughout. 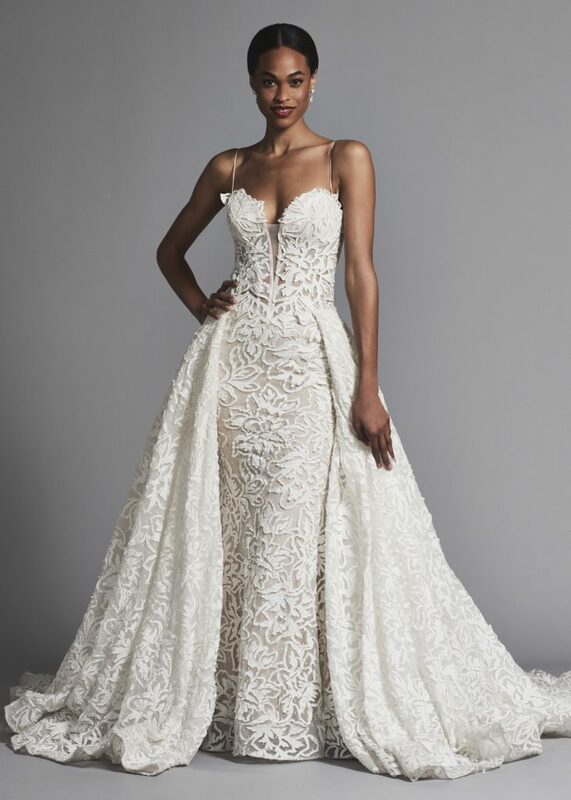 Why it’s worth it: The built-in corset (Pnina’s signature feature—for the most secure, flattering fit) laser-cut dramatic lace throughout, and breath-taking chapel length overskirt. Why it’s worth it: Hand-placed 3D floral appliqués, feminine illusion neckline and open back, and provocative sheer feathered overskirt (perfect for a ceremony to reception transition). Why it’s worth it: For the non-traditional bride (or the bride looking for a reception dress or rehearsal dinner dress), this dress is perfect. Hand-embroidered multi-colored flowers cascade down the bodice and back, down the feminine fluted sleeves and sheer skirt, complete with a daring slit. 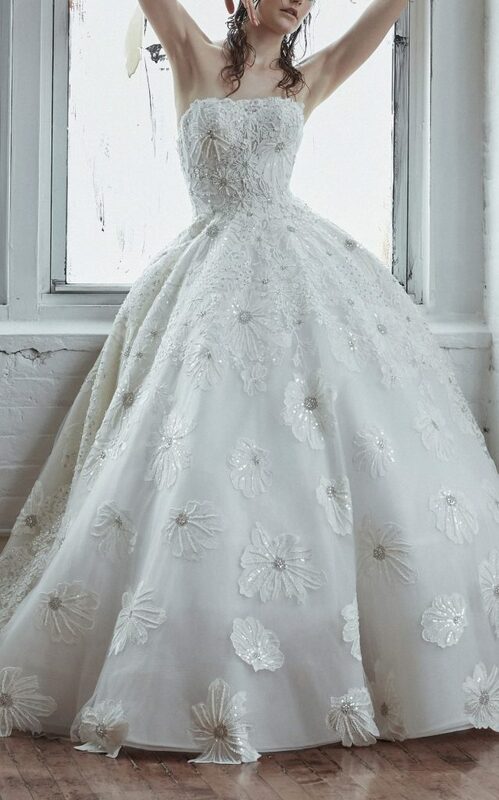 Why it’s worth it: Just the Swarovski crystals alone make this stunning & grand ball gown worth every penny—hundreds of hand-placed crystals cover this stunner, not to mention the dress also has a head-turning cathedral train. Ready to try one of these beauties on? Of course you are! Book an appointment here. 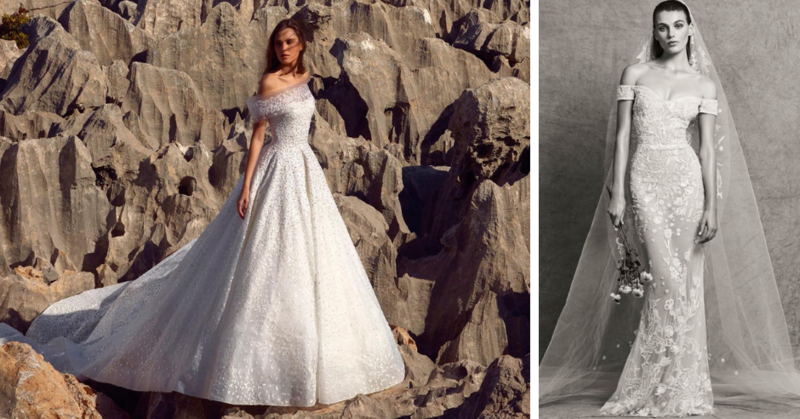 Want to learn more about these designers dedicated to creating handmade gowns? Browse our designer gallery. Loved this article? Read more like this one here!